All of the best-known basketball sneakers were high-tops. Every sneaker spokesman from Chuck Taylor to Michael Jordan to Allen Iverson to LeBron James had, until recently, worn signature high-tops. This isn’t true anymore. As Dan Nosowitz writes in an excellent Esquire article on basketball sneakers, the shoes have gone low. 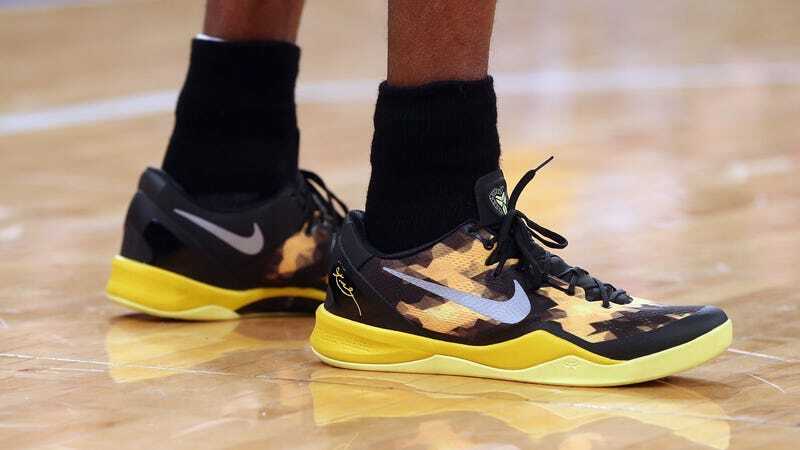 There’s no evidence high-tops do anything for the wearer in terms of avoiding ankle injuries—though there may be a psychosomatic effect—and recent versions of sneakers from James, Kevin Durant, Kyrie Irving are all low-tops. Even the oft-mocked all-white Curry Two Lows are low-tops. The official story, which feels sort of like a calm monologue in an ad, is that Kobe, though he attended high school just outside of Philadelphia, was mostly raised in Italy, and was passionate about soccer. Kobe noticed that soccer players, aside from the jumping unique to basketball, play in a fairly similar way to basketball players: lots of quick changes in direction, a lot of cutting, variation between sprinting and slower speeds, a need to suddenly spring in one direction or another. And when was the last time you saw a high-top soccer cleat? Is it possible that high-tops aren’t necessary for basketball, either? Of course Bryant would be the one requesting that he prove the haters wrong by wearing low-top basketball sneakers, then come up with an explanation that involves growing up in Italy and his love of soccer. You can almost trace the evolution of basketball sneakers from the 1990s to today by comparing Bryant’s first sneaker signature sneaker for Adidas, in 1998, to his recent Nike Kobe 11 Elite Low. At left: The moon boot-style KB8, released in the 1990s by Adidas (now released in retros as the Crazy 8). At right: Nike’s slick KB 11 Elite Low. Of course, some players still wear high-tops, and there are often high and low versions of the same model sneaker (at least for Nike kicks). But high-tops are no longer the only option for basketball players. As Nosowitz explains, players are more interested in performance sneakers than ever—and the low-tops are here to stay.